Our garden borders the river Seudre. 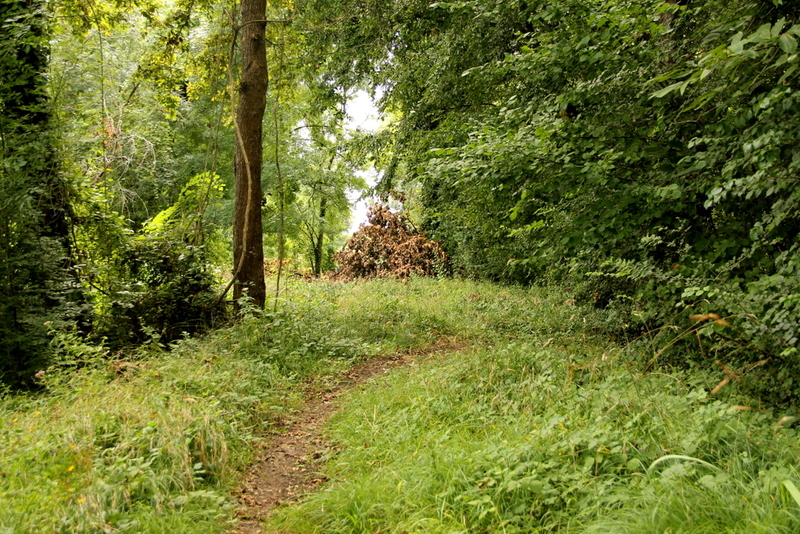 We have left a part of the land next to the river somewhat wild forming a little forest. After the recent storm it now resembles a war zone with broken trees scattered along it, waiting for the autumn when I will drag the branches to an open space and burn them. Amelia and I often walk on a path only a couple of minutes from our house, that takes us along the river and then through a forest to the nearby hamlet of Madion. It is a pretty walk that usually takes less than an hour, if Amelia doesn’t stop too long photographing the bees. Today we took the same path for the first time after the recent storm. 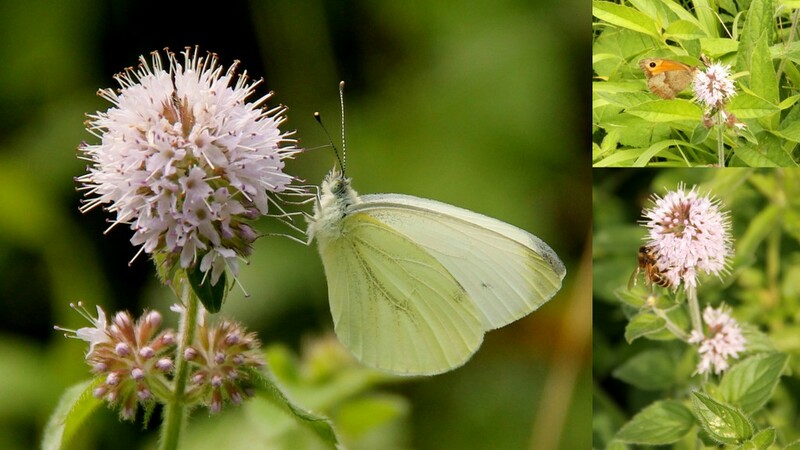 The wild mint is flowering just now and is adored by the bees and the butterflies. 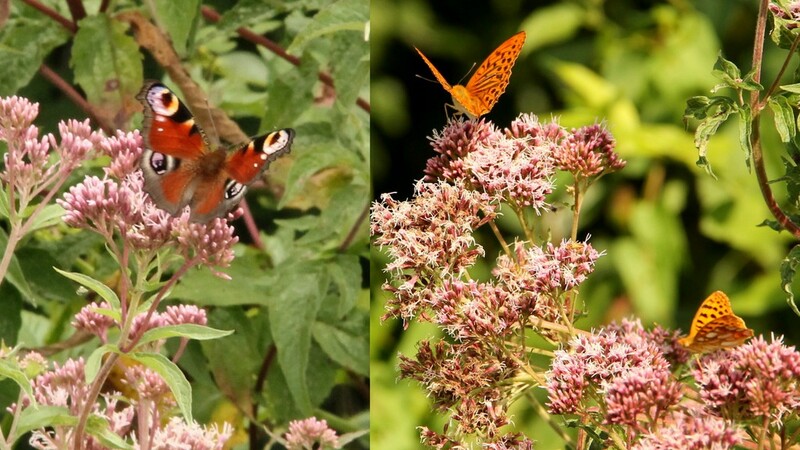 The hemp agrimony ( Eupatorium cannabinum ) remains a favourite of the butterflies. A little while later I realized why not many people had walked along the path lately. 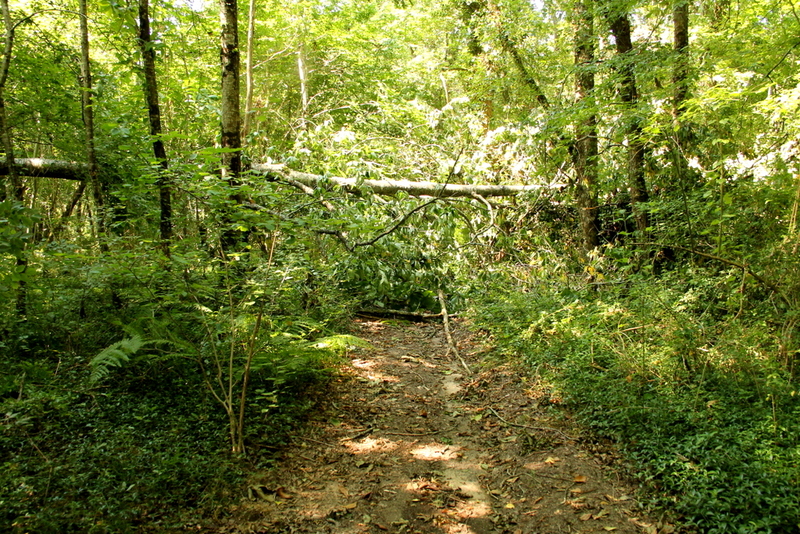 Between the river and the field of maze, the path was blocked by a broken tree. 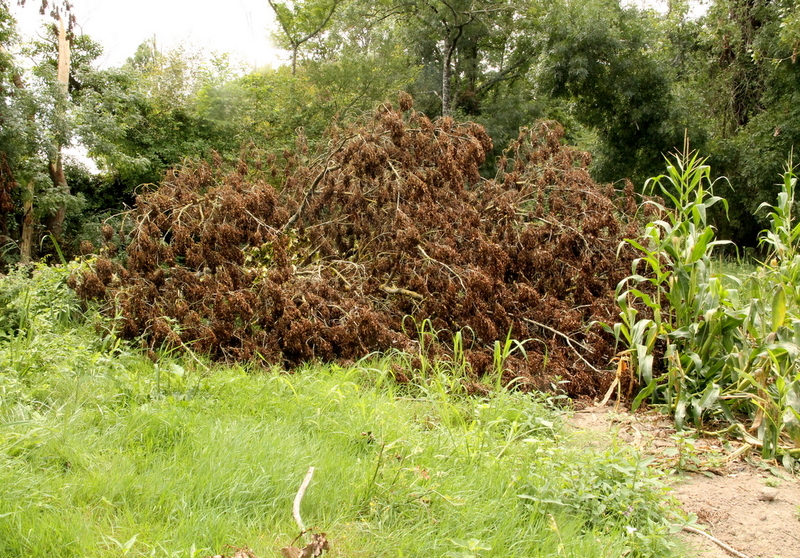 We maneuvered our way through the field of maize as many have fallen victim of the storm and were flattened. On the other side of the fallen tree, I encountered a patch of my worst hidden enemy in the garden: the stinging nettles. 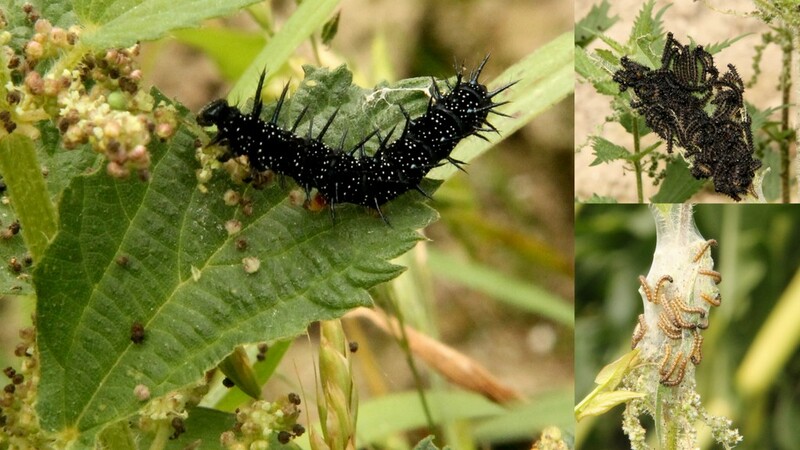 They were covered with caterpillars. Well my consolation is that at least we will have more butterflies. 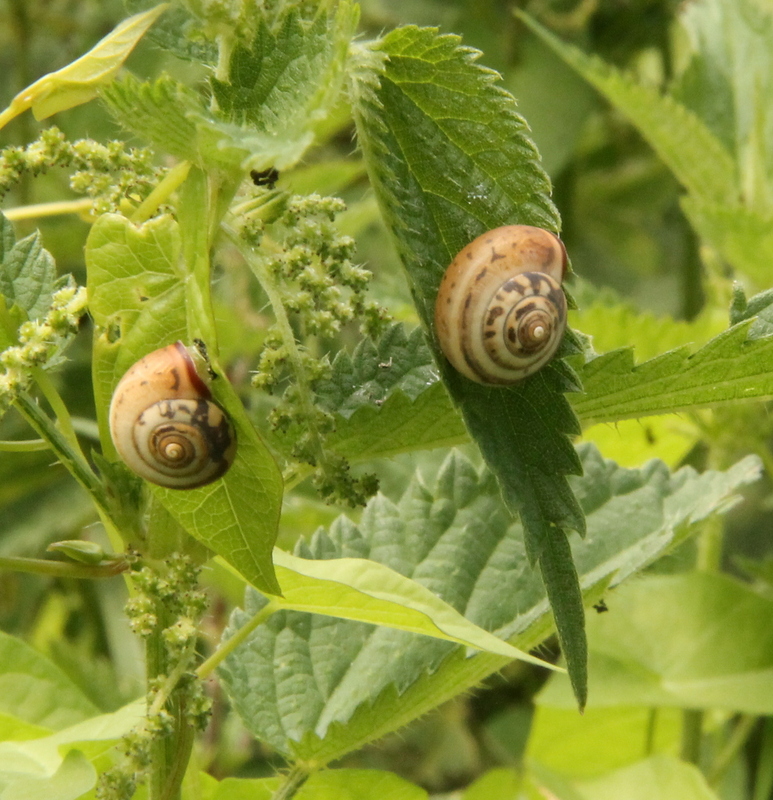 Like all little boys, I am fascinated by the form of the little snails. 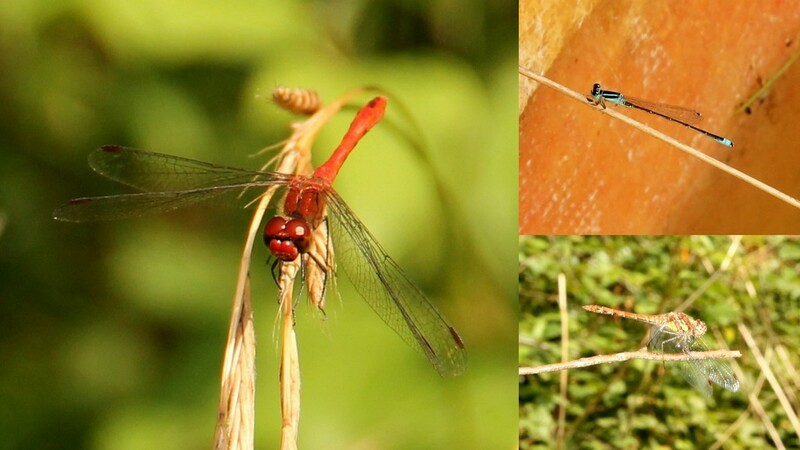 In the stillness and the heat of the late afternoon, I could see a few damsel flies and even the dragon flies. 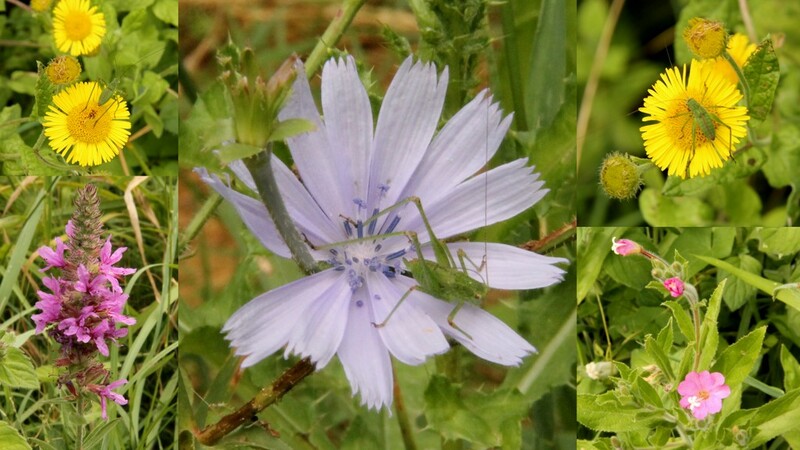 I am not a biologist, but merely an engineer, but it seemed to me that each wild plant and wild flower has its purpose in the life of the countryside. I could see that my path was yet again interrupted by another fallen tree. Never mind, I will turn right through the forest. That is my favourite route: so peaceful, and yet so full of promise. A few minute later the forest path was also blocked. We fought the branches and emerged yet again successfully on the other side and then left the forest into a much more open countryside. 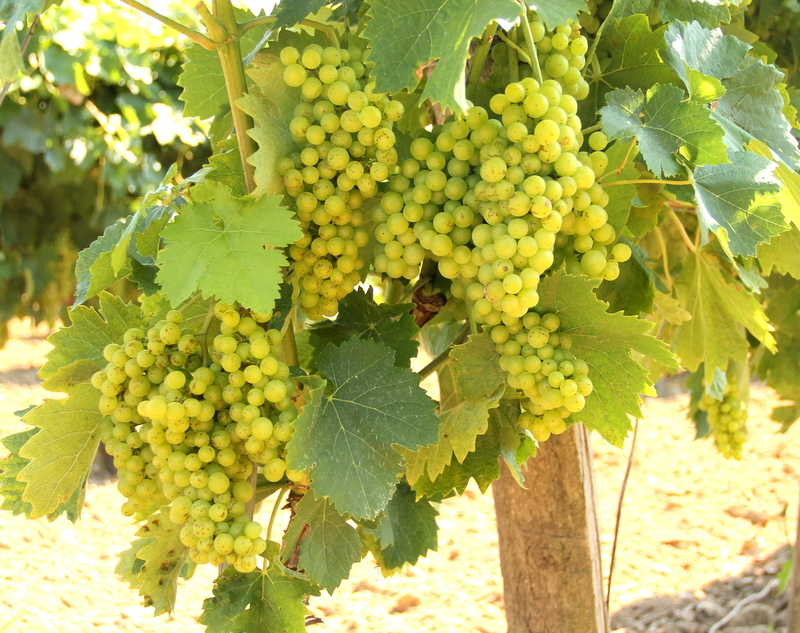 along the vineyards. On my left, a bunch of mislteoe: Perhaps waiting there for a stolen kiss? I do not know the people that live in that little farm building, but I have often thought that they have indeed chosen a corner of heaven. In the open ground there were more bees and butterflies. Even a queen bumble bee with her sac of pollen. The grains of grapes are swelling. Perhaps summer is already approaching its end? 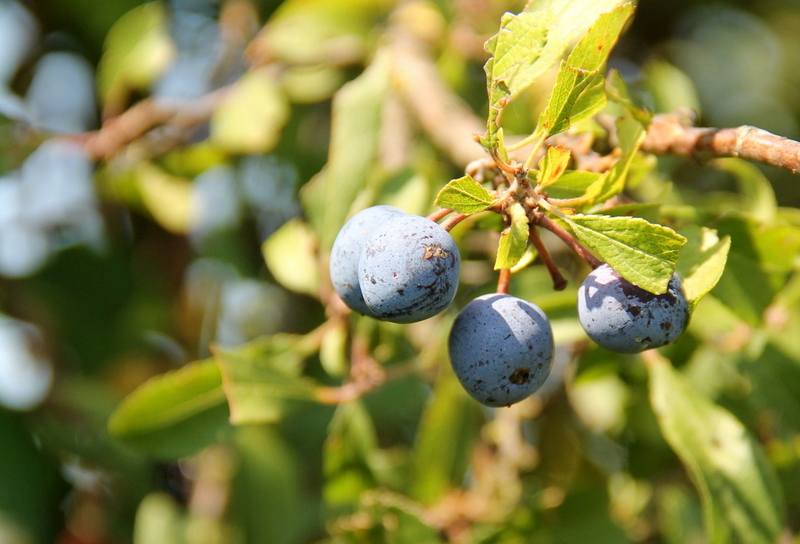 In this part of France they often plant sloe (prunus spinosa) along the edges of the fields. Its white flowers are pretty in early Spring, its fruit is eaten by some wild animals, and its thorn inhibit the intruders. 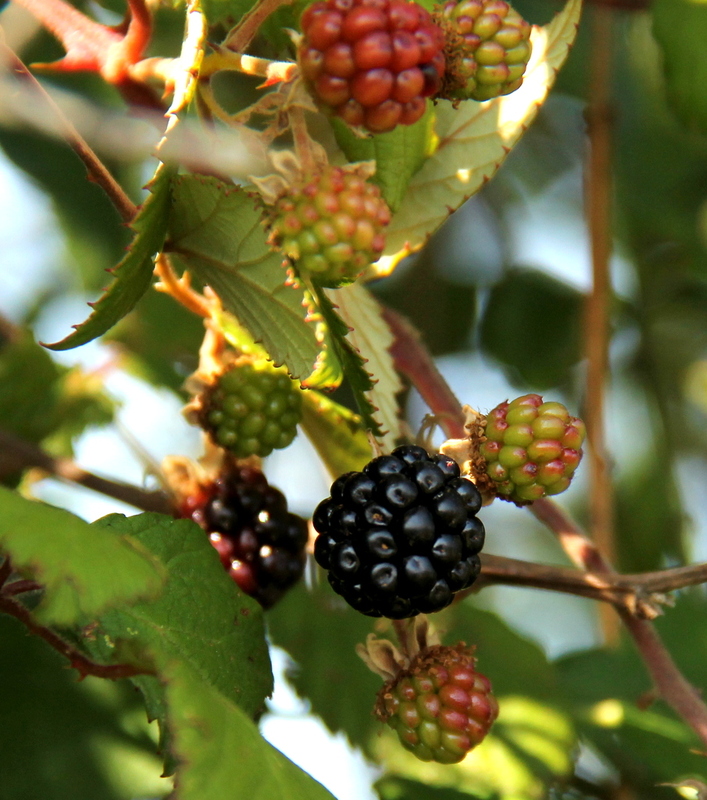 The wild blackberries are already ripening. Last year we collected several kilos of blackberries at this spot and Amelia made delicious jelly. 15th of August is the Assumption day. It is a National Holiday in France and some towns will have the last fireworks display of the season. After that the French holidaymakers start returning home to prepare the children for the rentrée scolaire. We are really lucky here that we have a mild climate and do not suffer from ‘uncontrollable’ wind very often. 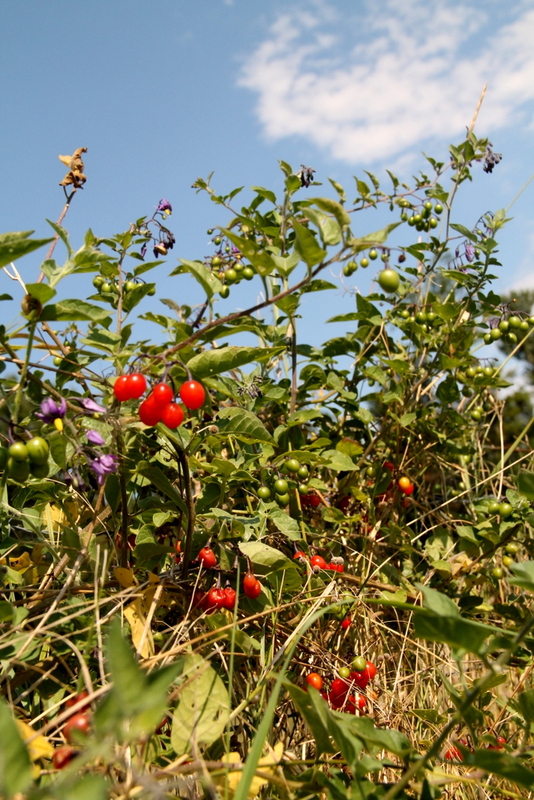 Our summers are warm, but not too hot and we are able to enjoy the last days of beautiful warm sunshine well into October and and when autumn at last comes we will return to the task of clearing Amelia’s afrenchgarden. 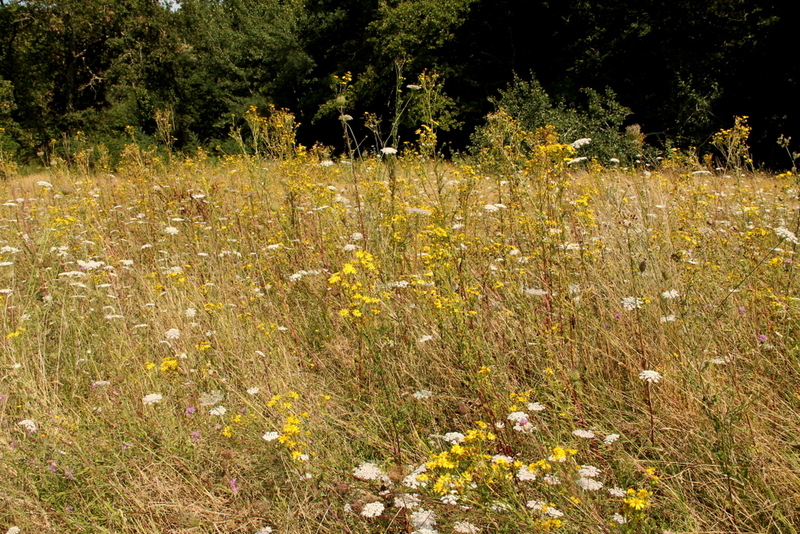 Categories: Nature | Tags: bees, butterflies, Charente Maritime, France, nature, wildlife | Permalink. What a lovely post – it has really brightened up my Friday afternoon. You really do live in a magical place! Such a beautiful variety of butterflies and an abundance of fruits. The colors of the butterflies are so vibrant. A very nice walk indeed. It’s a beautiful walk in spite of the storm damage. 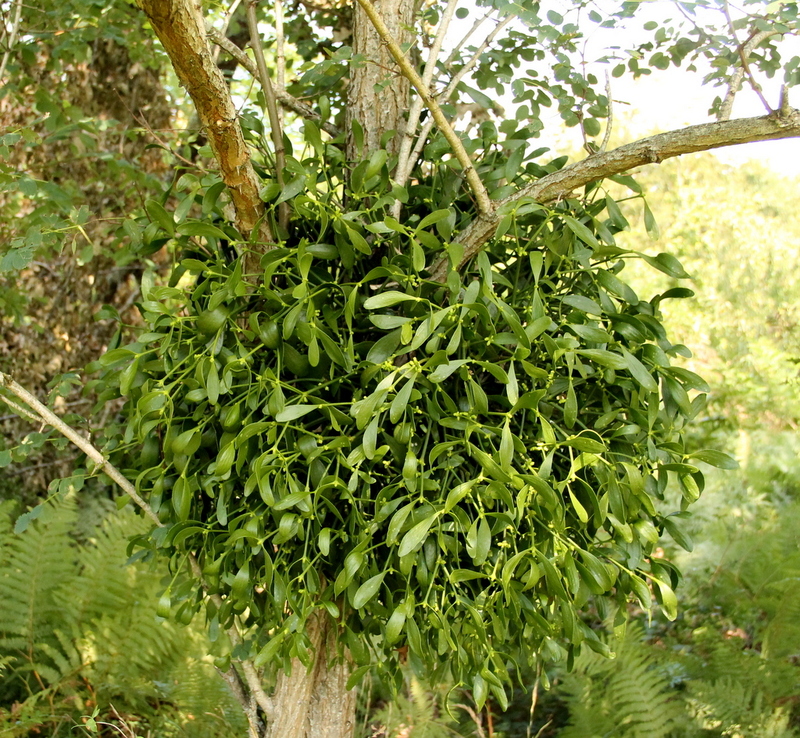 The mistletoe is interesting. I’ve never seen it growing anywhere. A lovely walk, with a few more diversions than usual. Did Amelia use the sloes for jam or gin? Sounds like you may have a lovely store cupboard or freezer full of homemade goodies from the garden. A lovely snapshot of your rural life! The picture of the farm buildings reminded me of the painting by Andrew Wyeth entitled Christina’s World. 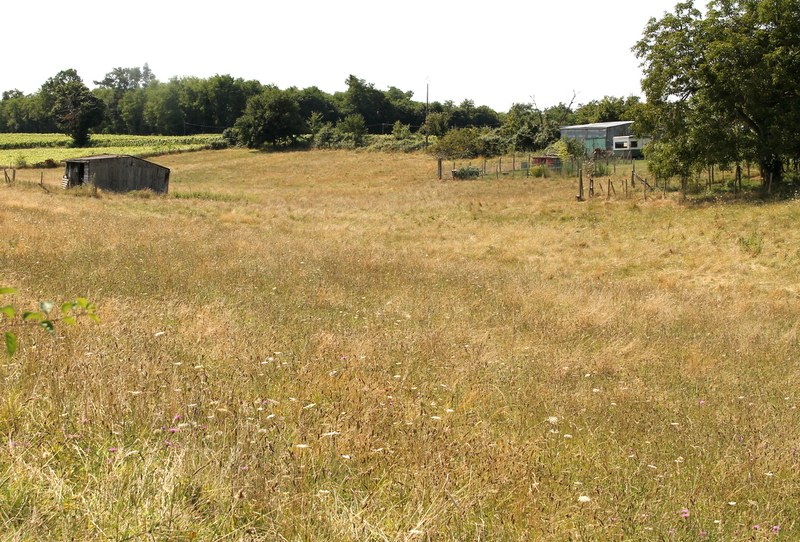 Amelia and I really appreciate that the countryside around our home is still so unspoiled. The modernity of life; the satellite television dishes; the telephone and internet connection to houses has not yet changed the way people live here. They still go to their local weekly markets; they hold local festivals and often we see several generation gather under a large tree in front of their house for lunch. Lovely rustic wander… and illustrations. 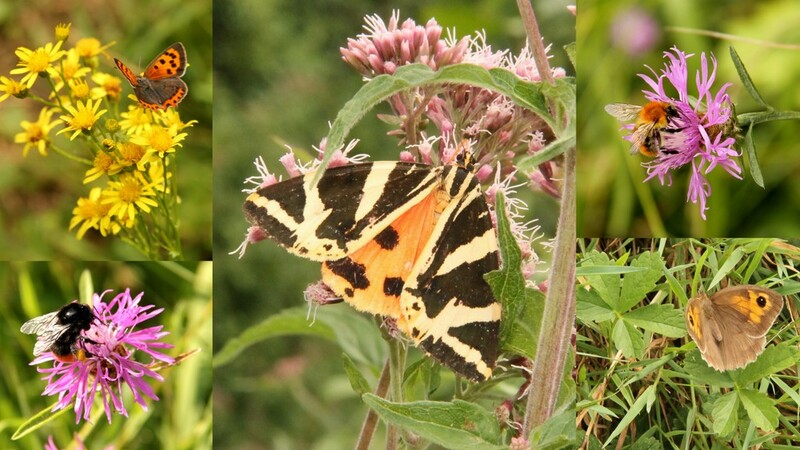 Thank you for sharing real touches of beauty…loved the butterfly photos. A poetry-quoting engineer – that would be a rare sighting indeed down here amongst the aerospace fraternity! Lovely post – I was transported along with you. I often have thought that without the song of the birds and the flight of the butterflies, nature would be a less beautiful place to walk through. I believe that without poetry our literature would be less rich and enjoyable. That’s quite an odyssey you’ve described in words and pictures. I like the way you incorporated lines from Shelley. Thank you, Steve. Amelia and I are lucky that we can just walk out of our front door and choose a number of walks depending on our mood. 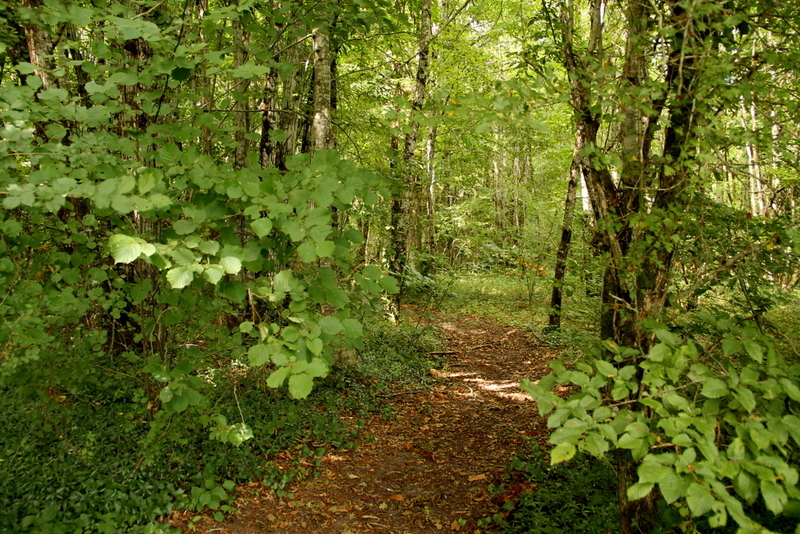 We have named each walk, like our ‘butterfly path’, or ‘river bank’ or simply ‘the walk around the chateau’. A lovely, slow, amiable meander. And some Shelley too. Perfect.